International Women’s Day provides us with a moment to pause and celebrate the contributions of diverse women, and to recognise the many ways in which women lead every day. This year, International Women’s Day also marked the one year anniversary of the Our Voice advocacy campaign. 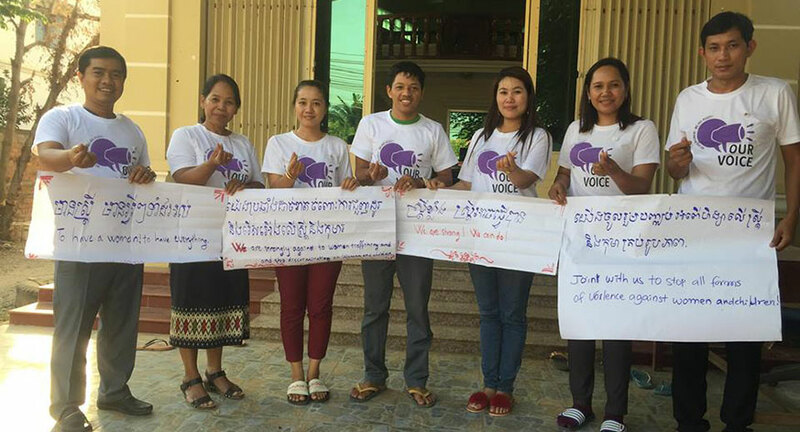 The Our Voice campaign is led by partners of IWDA’s Women’s Action for Voice and Empowerment (WAVE) program, which aims to increase the representation of women in diverse leadership positions. In the past year, many partners from across Asia Pacific have advocated for action to increase the representation of women at the local level, including through the use of Temporary Special Measures such as quotas and targets. Building on this momentum on International Women’s Day, Our Voice celebrated the past year of accomplishments and continued to raise our voices to demand women’s representation in local level leadership. To learn why women’s leadership at the local level is a key objective for the Our Voice campaign, check out our recent blog or list of demands in the brief Demanding Women’s Representation in Local Level Leadership [pdf]. In preparation for International Women’s Day, the 19 Our Voice partner organisations created joint messages on women’s local leadership which were emblazoned on tote bags and badges. Campaigners used these materials at marches, leadership workshops, radio broadcasts, panel discussions, community information sessions and social media campaigns. 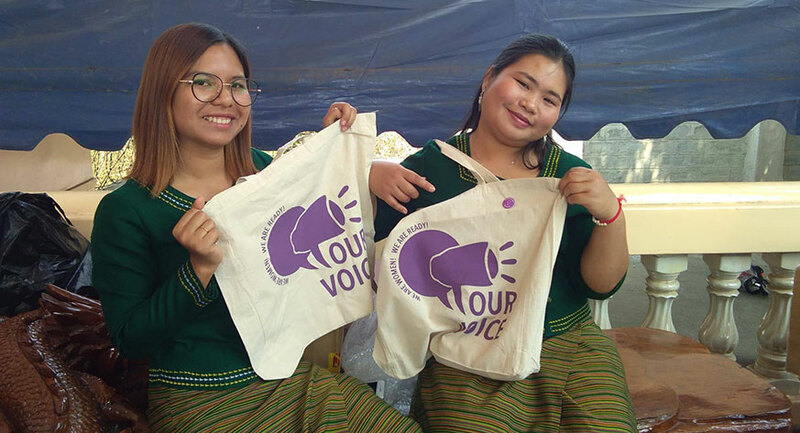 Shan Women’s Action Network staff in Shan State Myanmar shared Our Voice tote bags at a Balance for Better International Women's Day event – apparently they were a big hit! While each organisation used the Our Voice message in innovative and impactful ways appropriate to local contexts, general trends emerged to show the diversity of women’s leadership. 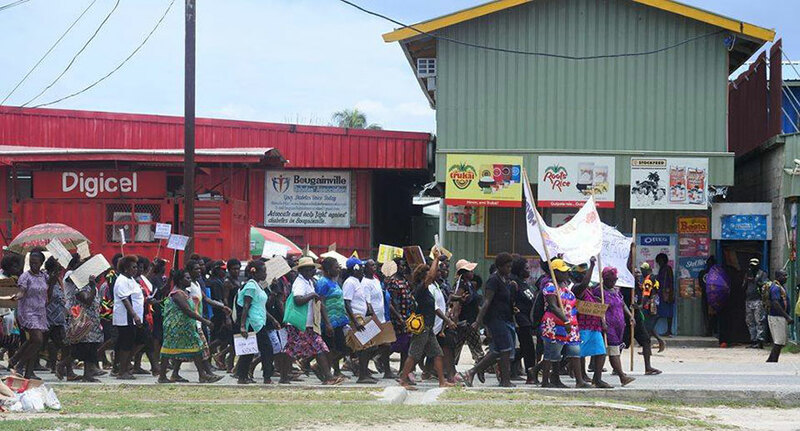 In the Autonomous Region of Bougainville, Our Voice partners Nazareth Centre for Rehabilitation and Bougainville Women’s Federation organised with other organisations in the area to march for peace and call for an end to violence in the region. Together they condemned the rising social issues in Buka, the region’s capital, and called on leaders to listen to and protect women’s voices. 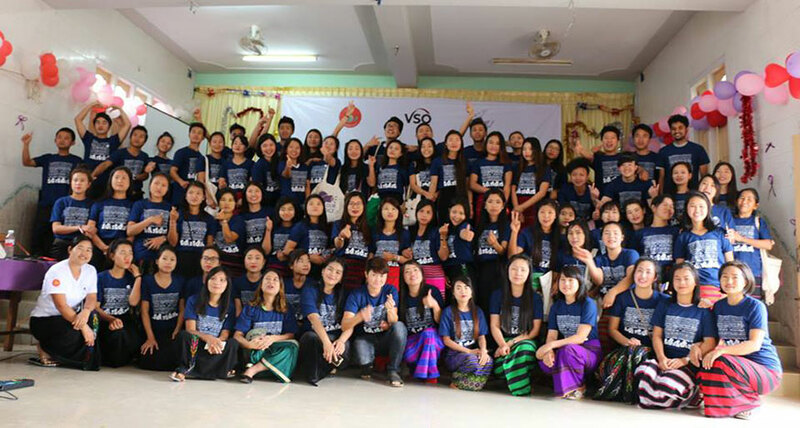 In Myanmar, Ta’ang Women’s Organisation and the Women’s League of Burma came together to demand greater access to justice and an end to impunity in Lashio, Shan State. Shan State is the location of a militarised conflict which undermines the safety and security of local civilians daily. These women’s organisations lead the way in calling for justice which recognises women’s voices and roles in peacekeeping. Four Our Voice partners took part in the global International Women’s Day theme #BalanceforBetter, a call to action for accelerating gender balance, including women’s equal representation. 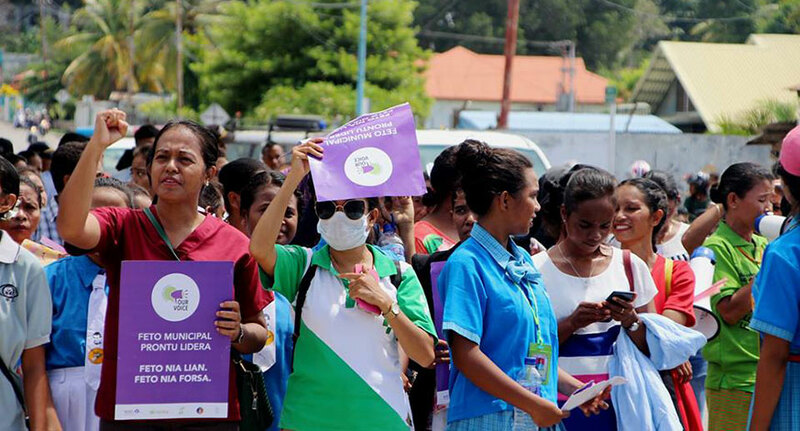 Covalima Community Centre held a march in Timor Leste to call for increased women’s representation in the development and governance of Covalima, with over 300 people in attendance. In Papua New Guinea, Eastern Highlands Family Voice hosted an event where they recognised and awarded 20 women leaders with Our Voice “I am a Leader” badges. The event encouraged women to work together in support of their leadership goals. 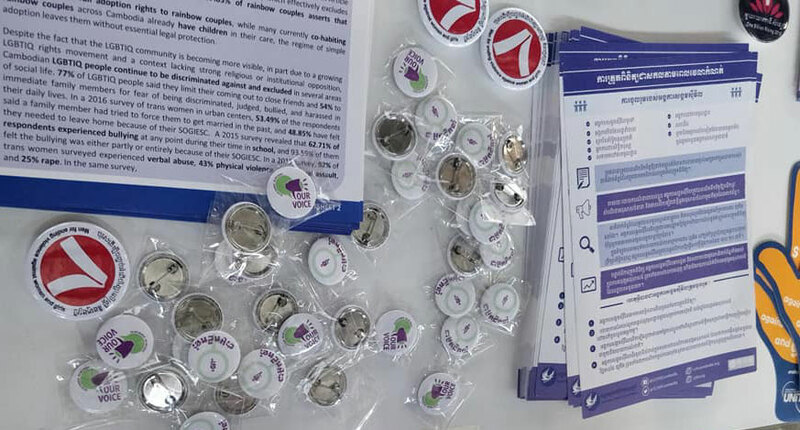 In Cambodia, Gender and Development for Cambodia (GADC) shared Our Voice materials and messages at a larger Balance for Better event in Phnom Penh. 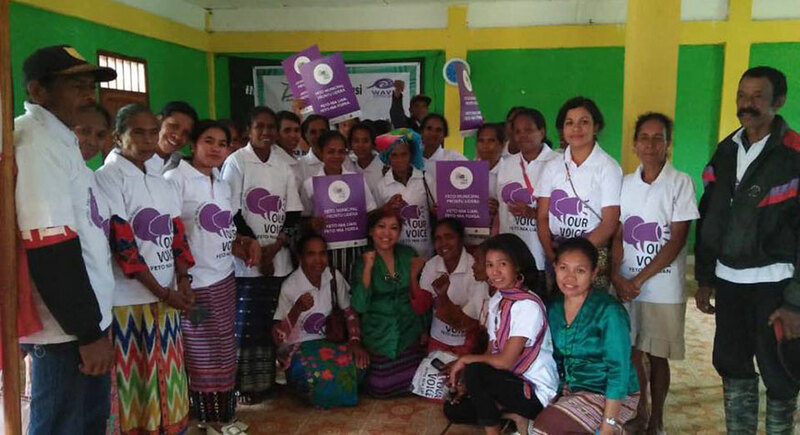 In preparation for the upcoming elections in Timor-Leste, Alola hosted an event to encourage women running for municipal level leadership to effectively participate in decision making positions. A potential woman candidate shared the message of the Our Voice campaign by stating “A women’s voice is a women’s power,” explaining that women are ready to lead. 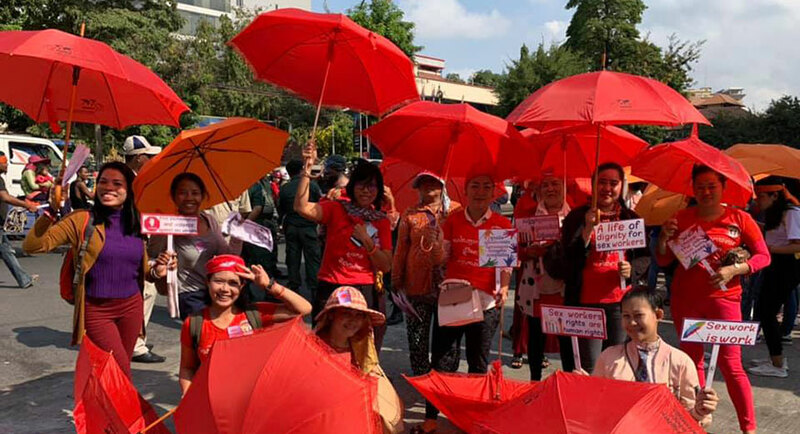 In Cambodia, Amara also held an event to empower women in local government, inviting 50 women commune councils, representing nine districts, to celebrate International Women’s Day. Attendees demanded women’s rights including the right to child care, equal pay, an eight-hour working day, and effective government. The diversity of action used to one clear message speaks to the power of joint advocacy and the solidarity of the growing Our Voice campaign. One month on from International Women’s Day it’s clear to see that Our Voice successfully recognised, celebrated and supported women’s leadership at the local level. For more photos check out the WAVE Facebook page.